Spring is around the corner and you may be thinking of green grass, sunshine and daffodils. I’m thinking of pasty white arms and hairy legs. Ha! Time for a little spring prep. 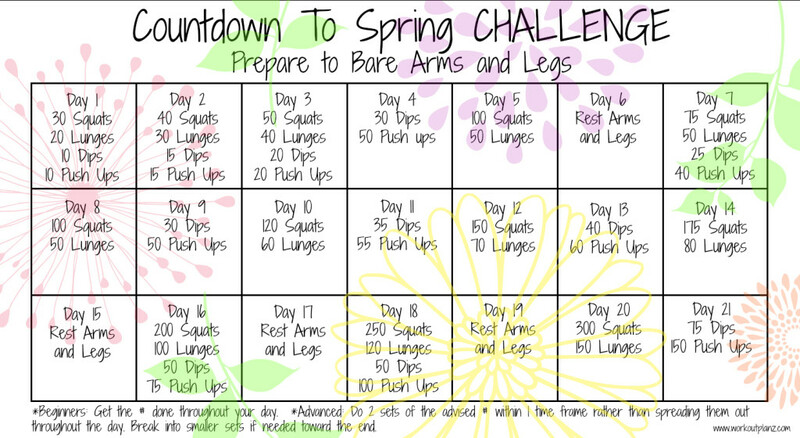 For a fun countdown to spring, I’ve put together a simple 21 day workout challenge to get your arms and legs ready for short sleeves and shorts! Whoop whoop! I’ll be posting videos of different variations of the exercises on my website. Follow the link here to view my blog where you can subscribe to get the posts delivered to your email or click here to check out (and like) my Facebook page so you can view the exercise videos there as I post. I will be beginning this challenge with my blog/Facebook friends on March 11th to take us through the end of the month, but you can start at any time. Take note of the beginner and advanced options at the bottom of the challenge sheet. Pin the image to have it handy for 21 Days or you can bookmark this post in your browser.